This is a simple build meant to fit in an Altoids tin, so you’re not getting a whole lot of hardware here. There’s a battery, there’s a boost circuit, and there’s a single chip, an ATtiny84. This tiny little microcontroller is the heart of the box, able to provide a drum track with a kick, snare, and a closed and open high hat. There’s a bass with a simple square wave and portamento, and an arp track that can be used as a lead or arpeggiated chords. All of this is programmed in C and uploaded straight to the chip. The ATtiny series of microcontrollers are fairly popular for various means and methods of creating square wave bleeps and bloops. We’ve seen them become a MIDI synth that fits inside a MIDI jack, and we’ve seen how much chiptune goodness you can fit in thirty two bytes of RAM. Cornell even had a spat of rickroll vandalism with a coin cell throwie built on an ATtiny85. Anything that puts more ATtiny chiptunes into the hands of more people is great in our books, and this Altoids tin synth is just the thing. You can check out a demo of the FATCAT below. As far as game consoles go, the Nintendo Wii was relatively small. Probably owing at least somewhat to the fact that it wasn’t a whole lot more than a slightly improved GameCube in a new case, but that’s another story entirely. So it’s not much of a surprise that people have modded Nintendo’s infamous money printing machine into handheld versions. But this…this is just something else. 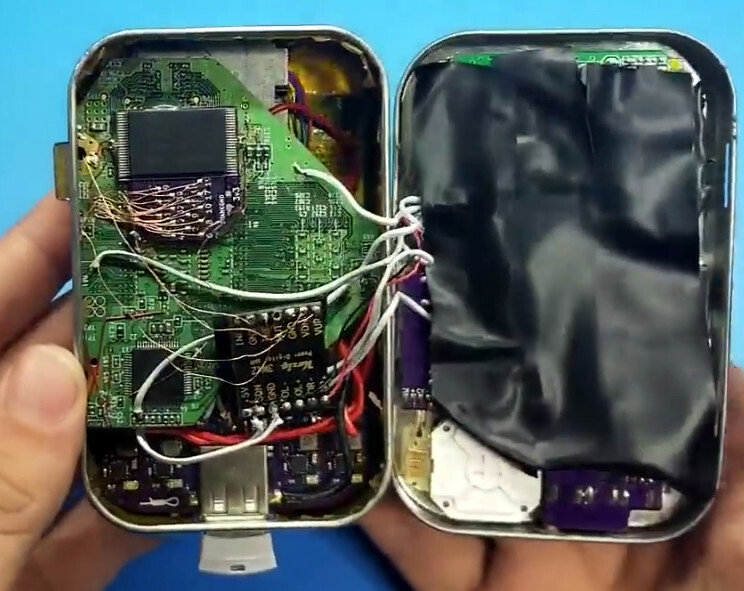 We’re going to go out on a limb and say that this absolutely preposterous build by [Shank] which puts a fully functional Nintendo Wii into an Altoids tin wins the title of “World’s Smallest Wii”. We’re also going to put money on the fact that this record doesn’t get beaten because…well, come on. There’s a reason he’s named his diminutive creation the “Kill Mii”. You’re probably wondering how this is possible. That’s an excellent question. As it turns out, hackers have discovered that you can cut off the majority of the Wii’s motherboard and still have a functioning system, albeit missing non-essential functions like the GameCube controller ports and SD card slot. From there, you just need to install a new firmware on the now heavily trimmed down Wii that tells it to ignore the fact it has no disc drive and load games as ISOs from an attached USB flash drive. That’s the high level summary anyway, the reality is that this a mod of crushing difficulty and should only be attempted by true masochists. As for this particular build, [Shank] went all in and even relocated the Wii’s NAND chip to make everything fit inside the tin. There’s also custom PCBs which interface the Wii’s motherboard with the Nintendo 3DS sliders he’s using for control sticks. Underneath everything there’s a battery that can run the whole device for a grand total of about 10 minutes, but given the general shape of the “Kill Mii” and the fact that most of the buttons are tactile switches, that’s probably about as long as you’d want to play the thing anyway. Yes, this is the worst Wii ever made. But that was also the point. In the words of the creator himself “This portable is not logical, comfortable, or practical. But it must be done… for the memes.” Truly an inspiration to us all. Incidentally, this isn’t the first “trimmed” Wii portable we’ve seen; though that one was considerably more forgiving internally, and just a bit more practical. I’ve always considered barcodes to be one of those invisible innovations that profoundly changed the world. What we might recognize as modern barcodes were originally designed as a labor-saving device in the rail and retail industries, but were quickly adopted by factories for automation, hospitals to help prevent medication errors, and a wide variety of other industries to track the movements of goods. The technology is accessible, since all you really need is a printer to make barcodes. If you’re already printing packaging for a product, it only costs you ink, or perhaps a small sticker. Barcodes are so ubiquitous that we’ve ceased noticing them; as an experiment I took a moment to count all of them on my (cluttered) desk – I found 43 and probably didn’t find them all. Despite that, I’ve only used them in exactly one project: a consultant and friend of mine asked me to build a reference database out of his fairly extensive library. I had a tablet with a camera in 2011, and used it to scan the ISBN barcodes to a list. That list was used to get the information needed to automatically enter the reference to a simple database, all I had to do was quickly verify that it was correct. While this saved me a lot of time, I learned that using tablet or smartphone cameras to scan barcodes was actually very cumbersome when you have a lot of them to process. And so I looked into what it takes to hack together a robust barcode system without breaking the bank. There are very few constants in the world of home-made electronics. Things that you might have found on the bench of a mid-1960s engineer working with germanium PNP transistors just as much as you might find on the bench of one in 2017 working on 32-bit microcontrollers. One of these constants is the humble Altoids tin. The ubiquitous mint container is as handy a size for the transistor circuits of previous decades as it is for the highly integrated circuits of today, and has become something of a standard form factor. One thing you might not expect in an Altoids tin though is a vacuum tube, even one protruding through the lid. [opeRaptor] though has done just that, though, with a very nicely executed design for a NIXIE clock in your favorite mint container. We’re writing this up as a Hackaday Prize entry so at this stage in the competition the boards are still in design for the prototype, but the difficult power supply to make 180 V DC from a single cell is already proven to work, as it the clock circuitry. The final clock will be a very compact device given the size of the tin, and will contain an ESP8266 board for wireless network connectivity. For a project at this early stage, there is frustratingly little real work to go on aside from some renders, but there is at least a video showing the PSU working driving a NIXIE, which we’ve put below the break. We’ve seen our fair share of Altoids mint tin projects and it seems the tin… can always house another interesting project. This time [MWAGNER] managed to make his long time idea of having a computer inside an Altoids tin. He had the idea in 2012, after the original raspberry pi came out, but the size constraints kept the project from going forward. The RPi Zero is much smaller and its launch made the project possible. [MWAGNER] made two versions, the first version of the PiMiniMint includes a screen, WiFi, Bluetooth, 32GB of storage, an infrared camera, and a full size USB port. All of this fit inside the Altoids tin. The second version has a battery — 2000mAh reportedly lasting for 6-8hrs. But there is only so much space to perform small miracles so in this version the camera had to go. This makes it a wireless standalone computer as you can control it with Bluetooth keyboard and mouse while connecting to the outside world over WiFi. Back in 2015, in Hacklet 29, we covered a bunch of Altoids based projects, from AM/FM transmitters to OTP generators and now we have a fully working laptop PC on a tin, screen and all. The project blog has all the instructions you need to try it yourself. If you do, let us know how it went and how long did that battery lasted. Newly minted hams like me generally find themselves asking, “What now?” after getting their tickets. Amateur radio has a lot of different sub-disciplines, ranging from volunteering for public service gigs to contesting, the closest thing the hobby has to a full-contact sport. But as I explore my options in the world of ham radio, I keep coming back to the one discipline that seems like the purest technical expression of the art and science of radio communication – low-power operation, or what’s known to hams as QRP. With QRP you can literally talk with someone across the planet on less power than it takes to run a night-light using a radio you built in an Altoids tin. Now that’s a challenge I can sink my teeth into. [Jim Merullo] and his son were enjoying a nice game of Frisbee when an unfortunate dive led to an injury. His son broke his pinky finger leaving doctors no choice other than bounding his entire left hand in an unreasonably large cast. For most, this would mean no use of the left hand for several weeks, which is somewhat problematic if your son has a Minecraft addiction. [Jim], however, is no stranger to the hacker community and began working on a solution. He broke out the #2 Philips screwdriver, fired up the soldering iron and got to work. A detailed analysis of the injured left hand revealed limited use of the middle and ring finger, and full use of the thumb. Because his son played the game using his right hand for the mouse and left for the keyboard, he needed to find a way for him to operate a keyboard with the limited use of his left hand. He took apart an old USB keyboard and soldered up some tactile switches to emulate the needed key presses. After making a fashionable Altoids tin mount that fit over the cast, his son was able to enjoy his favorite video game with limited interruption.